evaluating that spectrum for both natural and man-made nuclides. type and amount of gamma emitting radioactive material at that location. are present in the air at any given time. seen in various energy ranges, depending on the specific radionuclide. spectrum for both natural and man-made nuclides. Iodine-131 with a physical half-life of 8.05 days and an effective half-life in the whole body of 7.6 days possesses its greatest energy peak at 360 keV, a second-ranking peak at 280 keV, a third peak at 638 keV and a fourth peak at 724 keV (Arena, 1971). The lower couple fall into range 3 (200-400 keV) , whereas the higher couple fall into range 5 (600-800 keV) in the RadNet graph. Gamma spectrum of cesium-137 (Arena, 1971 ). Counts/channel are plotted on a logarithmic scale versus energy [keV]. Peaks are labelled in MeV. By contrast, cesium-137 with a physical half-life of 30.17 years and an effective half-life in the whole body of 70 days emits gamma radiation at 662 keV, falling into range 5 of the RadNet graph. 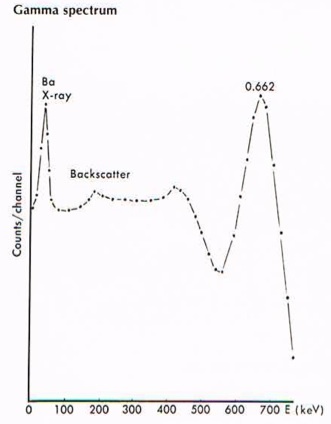 However, backscatter (Compton effect), that is low-energy detector counts produced by incomplete energy transfer between the ionizing radiation and the detector material, contributes a considerable fraction of the total count rate to range 3. 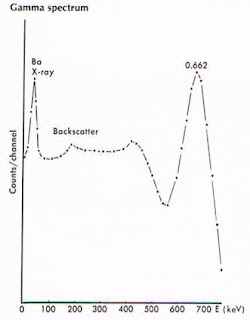 Although the precise shape of the spectral curves shown above depends on the radioactivity of the sources and the instruments used for the measurement, the energy peaks remain invariable and representative. Therefore, the spectra may can be employed for the demonstration of principles. Partial integration of the areas under the spectral curves taking the logarithmic scale of the counts/channel into account suggests that the iodine-131 decay contributes about 91 percent of the total count rate summed over both ranges to range 3, whereas cesium-137 decay will contribute about one third to this range. Therefore, if both isotopes are present in the sample, the count rate measured in range 3 does not exclusively reflect iodine-131 decay, and iodine-131 will also contribute to the count rate measured in range 5, though to a smaller degree than cesium-137. Despite this cross-contamination, a prominent increase in range 3 suggests the presence of iodine-131 and in range 5 that of cesium-137. Furthermore, the EPA provides offline post-hoc data for identified radioisotopes. Regardless of its low spectral resolution, the real-time RadNet graph may potentially have its uses for the identification of a radiological incident. An increase above the average counts per minute (CPM) measured in ranges 3 and 5 beyond three standard errors of the mean can be considered statistically significant with 95 percent confidence. Mean count rates measured in the past can be queried in the RadNet database. Sequences of up to 400 measurements can be downloaded in a batch. I personally witnessed the yellow line switched with the darker green line after the Federal shutdown. Energy range 4 is now what yellow used to be in terms of CPMs. I assumed it was just a color code change. But, your article states that yellow energy range 3 is still valid and reliable as indicating gamma radiation from cesium 137. I think this article needs to be updated. yes,needs updated ! and should have 3 or more back ups!! my android pocket geiger counter free app scaring the hell out of me,went to freemont ohio, could see big ploom bottom screen turned red 600 c.p.m. 50.50 milsvh/h that was two weeks ago,then found sandusky about the same.. this is reconcertrating! not getting weeker,in rain and snow,ruins the soil and water,why isent this in the news,may be some one would care?,and stop fukashima? ?,so some could live? ?right now 32.35 cpm and 1.22 milsv/h,cant inpeac a muslem 9-11 inside job #1 stop fukashima now!!!!!!!!!!!!!!!!!! !right now!!!!!!!!!!!!!!!!!!!!!!!! !good buy! i just saved alot on my obmacare,thanks..
fukushima just can't be stopped. so enjoy your green, clean, too cheap to meter.